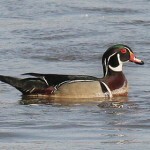 Description: Shaggy double crest on back of green-black head. 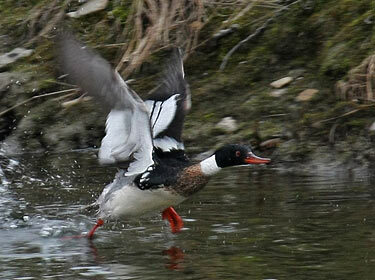 Reddish bill, black mantle with white on either side, gray flanks, wide white collar, and brown streaked breast. Female, brown with white chin and breast. 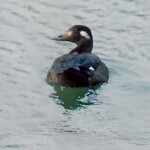 Female also shows shaggy double crest and reddish bill. Behavior: Hides nest and eggs among roots, rocks, or in burrows of other animals. 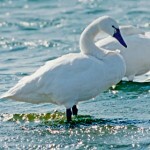 Habitat: Migrating birds are found on lakes, reservoirs, and larger rivers. Usually winters on coasts. Where in Nebraska: Occasional to rare spring and fall migrant across Nebraska. More common in the east rather than in the west. Rarely overwinters. Fun Facts: Within a day or so of hatching the young leave the nest and begin feeding on their own. Known to fish cooperatively by driving fish into shallow water.